The Gain/Loss Report is a record of how well your trades have performed. Each “buy” is matched with the corresponding “sell” transaction and the gain or loss on that trade shown in the report. To access the Gain/Loss Report, click on the “Reports” button in the toolbar and select the “Gain/Loss” Report type. You can filter which trades are visible in the report by using the filtering tools to the right of the Report type selector. Range - allows you to specify a standard date range (“This Month”, “Last 3 Months”, “Year to Date”, etc) for the trades that should be shown in the report. If the “Close Date” of the trade falls within the date range, the trade will be included in the report. From and To - allow you to specify a precise range of dates for the trades that should be shown in the report. If the “Close Date” of the trade falls within the date range, the trade will be included in the report. Symbol - allows you to show only the trades for a specific ticker symbol. Include open positions - allows you to include open positions in the report, using the current date as the “Close Date”. You can set all of the filtering tools back to their default settings by clicking on the “Reset filters” menu found in the “More” menu on the right of the toolbar. You can export your Gain/Loss Report to CSV for use in a spreadsheet like Microsoft Excel or OpenOffice Calc. In the “Gain/Loss Export” window, select the file to which the trades will be written. The exported file will contain all of the currently displayed trades with all of the currently configured columns. 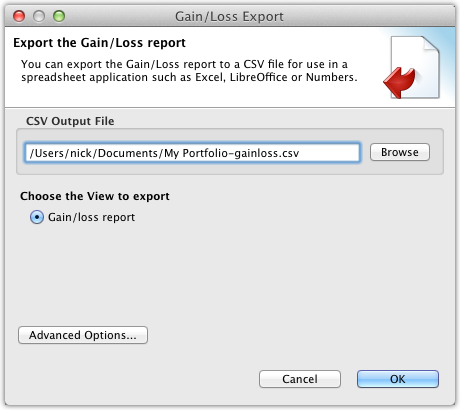 Press OK to export the Gain/Loss Report to CSV. Clicking on the file’s link in the finished window will open the file in your spreadsheet application.